1. It is a FEPTO member organisation (or a temporary organizing committee of member organizations) that invites. It is not a person who invites. But what we call the “local” organization delegates some persons, forming a local committee. 2. When the local organization invites FEPTO, they take the responsibility (work, manpower, finances) to invite inside an in FEPTO usual maximum for hotel costs and registration fee and to offer the needed facilities. 3. The local organization and FEPTO organize or better co-create the meeting together, but there are differences in responsibility, the local organization being mostly the host for the event during one week (but prepared during more than one year) and FEPTO being mostly in charge of the professional, scientific and associational aspects of the meeting and the continuity. – Hotel, B&B, Catering Coffee or tea, biscuits, fruit juice. – Social programme, excursion, special dinner with local atmosphere, meeting of local psychodrama societies. Also a social programme for accompanying persons. Tours before or after the meeting. – A documentation file for each participant with the agenda of the meeting, list of participants with their addresses, documentation about the country, the place and neighbourhood, psychodrama in the country, the more scientific and organizational documents given by FEPTO, tickets for meals, invitation for a reception. Also some paper and a ball-point. 5. The local organizing committee is (since 2009) also in charge of the programme and the organisation of the professional, scientific and associational meetings, which is to be discussed with FEPTO (especially the AM-chair and -committee). The FEPTO-Council is in charge of the GA and the voting with the help of the local organizing committee. Guest persons at the meetings are invited by FEPTO. Scholarships are decided by FEPTO and given from the 10% of the present registration fees and from the profit of previous meetings. FEPTO tells about the programme, the theme of the meeting, the goals, also to attract participants. 7. Finance. They are mostly about the host function, so the local organizing committee is responsible to make the budget and the accounts. FEPTO has to introduce his planned costs (photocopies) and 10% for scholarships in the registration budget. The profit goes for more scholarships the next year. • Each training institute can send 3 representatives. • Each accrediting institute can send 2 representatives. • The local organizers can send two more participants. • The institutes/organizations decide who will be their representative for the FEPTO Annual Meeting. To ensure a continuity of work and exchange it is advisable to have the same representatives for some years. 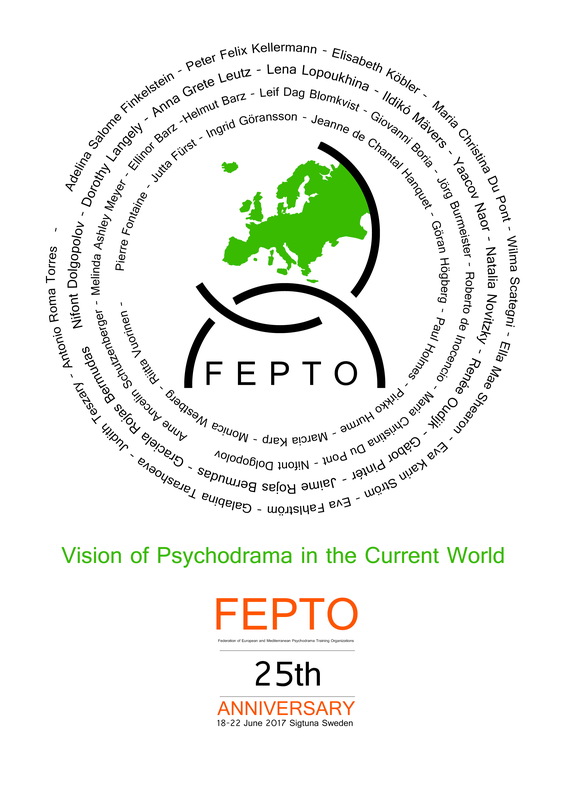 • Psychodramatists who want to register for the FEPTO meeting, even if they have been participant in previous meetings, have to be delegated by their institute/organization as representative or as delegate. • The local organizers take it for granted that someone who registers is authorized by the psychodrama training institute or accrediting organization she/he belongs to. • The local organizers accept only the first three people of a training institute or the first two of an accrediting institute. In case they receive more registrations than allowed by the regulations, they notify the institute in order to get a decision. The local organizers inform the FEPTO members of this procedure and announce that the participants should be trainers or practitioners. This procedure was published in the FEPTO Newsletter 9.2. Students, practitioners and trainers are welcome to register for the FEPTO Post- or Pre-Meeting-Conference. Representative: is an individual who represents the member organisation. Accompanying people: refers only to representatives and not to guests. Only representatives can come with an accompanying person. • A guest is a participant of the FEPTO Annual Meeting who is invited by the Council to represent an institute that is not yet a member of FEPTO or for another special purpose (e.g. lecture). • Members of the past and present Councils are permanent guests of the AM and need no invitations. • Representatives of candidate members or interested psychodrama training or accrediting organizations can be invited by the council. According to the guidelines they need a member of FEPTO being their “godfather” who introduces them as guests at the annual meeting. • The local organizers have to check the invitation of a guest with the registration. • The council has to give a copy of each invitation or a list of invited guests to the LOC (Local Organizing Committee). • And a guest has to send a copy of the invitation with the registration. So if the LOC receives a registration of someone who is neither a representative nor a founding member and has no invitation they have to refer the guest to the council/AM chair for clarification. As you all know, each year FEPTO provides scholarships for the Annual Meeting (AM) and for the FEPTO Conference (FC). Sometimes people wonder what is the procedure. We have kept it simple and are presenting it here. For the Annual Meeting ,one scholarship per institute is available (i.e. scholarships are not granted to individuals, nor to founding members, only to institutes). May apply for that scholarship all institutes (members of FEPTO) from countries such as Bulgaria, Croatia*, Estonia*, FYROM (Former Yugoslav Republic of Macedonia), Greece*, Hungary, Latvia*, Lithuania*, Poland, Portugal*, Romania, Russia, Serbia ant Turkey. Since one scholarship only is granted per institute, if a second person were to need another scholarship in order to represent the same institute, both applicants would have to discuss it and to come together to an agreement. In case when some scholarships remain available 1 month before the AM, a second scholarship may be granted to an institute requiring so. For the FEPTO Conference, one scholarship per person is available for participants coming from countries such as Bulgaria, FYROM (Former Yugoslav Republic of Macedonia), Greece*, Hungary*, Romania, Russia and Serbia. No matter which institute from FEPTO they are coming from, norhow many people are coming from the same institute. How much is a scholarship? FEPTO policy is to offer scholarships not exceeding 10% of the total amount of participants (fees) registered. This is based on the (almost) monthly report of FEPTO Treasurer or the Local organizing Committee (LOC). If the applicant, does not register within the early bird deadline, FEPTO still provide the scholarship based on the early bird fee; what is left of the regular fee then remains to be paid by the participant. A full scholarship represents 2/3 of the early bird registration fee. This amount is covered by FEPTO. The applicant needs to pay the third left. *Institutes representatives (for the AM) and participants (for FC) coming from Hungary and Greece get half a scholarship, which means that 1/3 of the early bird registration fee is paid by FEPTO and 2/3 by the applicant. The Development Committee is in charge of the process of attribution of the scholarships. It is a four-step rather simple procedure, based on the following rule : first come, first served. If this is not done the scholarship will go to someone else. 4. Upon reception of these elements of confirmation, a mail is sent finalizing the granting of the scholarship. As for the waiting list : as soon as other scholarships are available, provided a sufficient number of participants have newly registered, we inform the applicants, and, send the first emails of tentative confirmation. Make sure that there are 5-6 persons in your organisation who are motivated and will have time to build an organisational team. • One coordinator who is good in that. Ask companies (bank, assurances etc) if they are willing to contribute to the meeting by giving folders, writing material etc. Then you need not to budget it. Reservation at the chosen hotel or seminar place. • To reserve 30 rooms is not enough. There are always about 10-15 people who like to have a single room (it depends on the prices). So you need 40 double rooms if some of them can be used as single. • Think about handicapped people. If possible try to establish a computer supported registration, a transfer to the hotel, an automatically transcription into a list and an automatically confirmation. 3 month 2nd announcement (mail, post, newsletter and homepage) with the final programme and traffic information about reaching the meeting place.